Over the years, we’ve seen different traditional lamps used in wall lamps, the most popular among them being: metal halide, high pressure sodium, fluorescent lamps, and mercury vapor. Throughout this while, the invention of the different traditional wall pack lights have seen increased capability to generate brighter lights, even when subjected to harsh weathers. As capable as they may be however, they are never as efficient as LED lamps. LED wall packs are not only very functional, but they are also many times more efficient. They outperform traditional light in almost all aspects, including: light output, energy consumption, life uniformity, maintenance, life expectancy, and heat emission. Generally, wall pack lights are classified into four types, including; flood wall pack lights, full cutoff, semi cutoff, and up-down wall packs. While the full cutoff and semi cutoff wall packs dispense their lights downwards, flood wall lights mainly distribute their lights outwards, and up-down wall packs distribute downwards and upwards. If after all consideration, you think LEDs are the perfect choice to go with, but you are stuck with choosing with choosing wall packs, here are five considerations that should help you make the right decision. In the past, people popularly used watts as basic criteria for determining how bright a light bulb is. Things have fast taken a new dimension and these days watts are no longer looked at to determine the brightness of a light bulb. Watts now simply signifies the amount of electricity that is drawn by an LED bulb. On the aspect of its brightness, lumens now serve as the most important criteria looked at. Lumen represents the measure of visible light produced by a light source. It is the level of brightness that you see. The more lumen an LED bulb emits, the brighter it appears. Lumens are highly important, especially for differentiating LED bulbs from conventional bulbs. For instance, in a situation where you want to replace a metal halide wall pack installation, with LED wall packs, lumens can act as indicator to whether the LED you’re installing will be as bright as the metal halide. We are certainly at a time when energy saving means a lot. Of course everyone remembers to switch on the lights when in dark areas, but only few people remember to switch it off. Modern LEDs have been built with motion sensor features for the purpose of significantly reducing the rate of energy consumption on any building. Normally, LEDs have the power to lower energy consumption by up to 75%, but when combined with motion sensors, energy consumption gets lowered by up to 90%. Motion sensors are special features built into LEDs to automatically turn the light on when any motion is detected, and turn it off when no motion is detected after some minutes. Building owners have learned to install LEDs that are equipped with motion sensors in areas where lights are nor really needed at all times. Motion sensors are either installed by LED manufacturers during production or in a few cases, by the users after purchase. You should lookout for photocells during purchase. Photocells are ideal; they function as light sensors and unlike infrared sensors that basically detects presence, they detect lights. They also act like light sensitive resistors, hence earning the name photo-resistors. Their resistance level climb when used in darker areas and this is how it works: the photocells sends signal to the circuit to provide more or less current. Manufacturers of LEDs install photocells during production, hence there is no need for additional integration. Photocells are preferably used in dusk to dawn wall packs, automatically switching the light on when it gets dark and switching it off in the morning, when it gets bright again. This feature of turning the light on only when it’s needed helps to elongate the life of the LED, as well as reduce its maintenance cost. Installation location greatly determines how the efficiency level of a light fixture and how much it lasts. Operational conditions like water and humidity can generally affect the efficiency of light bulbs, hence, it is very important to get bulbs with special features that allows for operation in wet locations. A wet location is a place where light fixtures come in direct contact with water and other forms of moisture. Lighting fixtures that are installed in wet locations should feature UL Wet Rating as part of protection from water and moisture. If fixtures that are not built to be wet rated are continuously exposed to wet conditions, their life expectancy gets affected negatively. Wall pack lights, otherwise known as exterior building lights are outdoor lights that are mounted on outer walls of buildings. They are the ideal light up fixtures for streets, driveways, and walkways. This fixture are basically used to enhance the safety of a particular place, but they also enhance the beauty of an exterior. For instance, a unique modern designed wall pack light can illuminate an area, as well as add architectural detailing to any outdoor space. 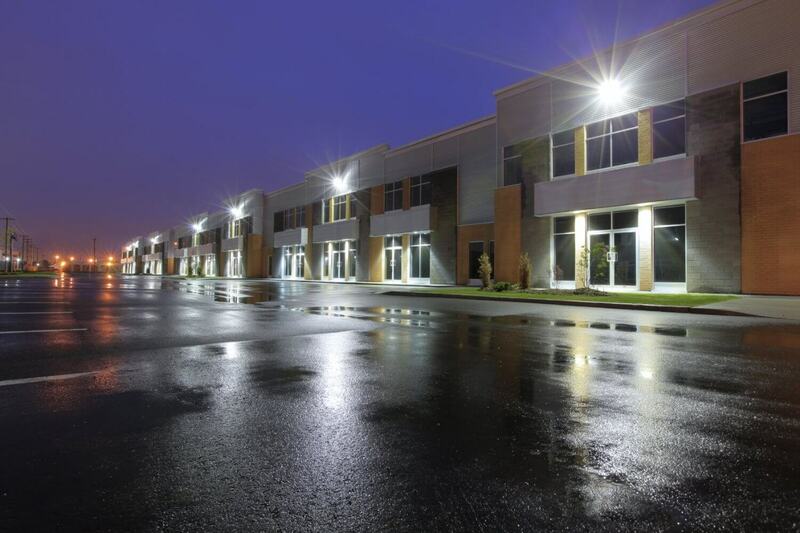 Let’s examine these three types of wall pack lights, and highlight why the are the right fixture for your building. This fixture is an excellent addition to any large exterior space for their low level of light pollution and high light intensity. They are great for improving safety outside commercial buildings and parking garages. Their maintenance cost and long lifespan make them great replacements for metal halide lights. The LED wall packs being offered by PatriotLED lasts for up to 100,000 hours. They draw power between 24w-96w and their color temperature is between 5000k and 5700k. Like we mentioned earlier, this kind of wall packs dispense light downwards, but it still provides an amazing intensity of light that supports safety and security. They are used in outside commercial buildings, garages, parking lots, hospitals and public spaces. They consume very little electricity and are very easy to maintain.